I first saw this recipe at Elly Says Opa a long time ago and had been wanting to try it. I normally make my own tzatiki sauce and buy the pita bread at Niko Nikos, but now that I have a winning homemade pita bread recipe, I knew it was time to give these a go. They were really good. C asked if I would be able to make them with the traditional lamb...um...probably not. We can just go to Niko Nikos for that. Preheat the broiler. Sprinkle the chicken with salt and pepper on both sides, and then broil until cooked through, about 5 minutes per side, depending what size/type chicken you are using. Allow the chicken to rest for a few minutes before slicing into strips. Meanwhile, heat your pitas. I have a gas stove, so I just spray them with a little bit of oil and stick them right on the burner for a few seconds per side. 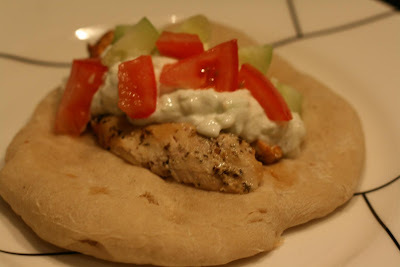 Top the pita with the chicken, tzatziki, and tomatoes. Roll up and eat! Place strainer over large bowl. Line strainer with 3 layers of cheesecloth or papertowel. Spoon yogurt into cheesecloth-lined strainer; let strain for minimum of three hours. Transfer yogurt to medium bowl; discard liquid. Meanwhile, add the cucumber to the bowl of a food processor and pulse 5 to 8 times until it reaches a coarse grated consistency. Drain liquid from the cucumber. Mince garlic with salt. Mix cucumber and garlic into yogurt. Can be made 1 day ahead. Cover and refrigerate.